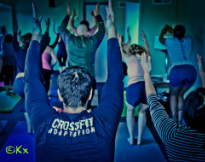 Read the published feature article by Kat on How Yoga and CrossFit Can Work Together on Mind Body Green.com. Check out the latest online article featured in BoxLife Magazine, "CrossFit Hipster Flow: 4 Hip-Opening Poses." Read the article here. Read more publications by picking up the latest copy of Box Life Magazine! Featured photo by Andrea Taylor Photography.